It's July 2000: the Gore/Bush/Nader election cycle is in full swing, the Camp David Summit is falling apart, and in Tenleytown, a modern Jewish family is fracturing over what to do with their 14th Street real estate. Their mother has died, their father will need full-time care, and as their adult children debate what to do next, no topic is off limits: American Jews and their relationship to Israel, who's already given enough to this family, a sibling's parenting choices. A political and deeply personal play about history, responsibility, and what we're willing to sacrifice for a new beginning, told with vicious humor and unflinching honesty by Bethesda native Steven Levenson. "...Studio Theatre’s staging of Steven Levenson’s If I Forget offers a moving, if uneven, production of a powerful play. The gripping D.C.-set Jewish family drama, ignited by fierce political debate, seems designed by Levenson, a Bethesda native, to cajole and discomfort in equal measure. It’s up to director Matt Torney to keep the intra-familial mudslinging not just emotionally ripe but entertaining, and he and the cast are up to the task. Opening mood music that sounds disconcertingly like the theme of a treacly TV drama casts doubt at the outset, but Torney and company prove to know their way around the Tenleytown home of the play’s Fischer family." "...Director Matt Torney's all-star cast has infectious energy and chemistry. Jonathan Goldstein as Michael Fischer, the secular and academically provocative Jewish studies professor, takes on his impassioned speeches with aplomb. The charming Susan Rome as oldest sister Holly is an absolute force, and Robin Abramson as youngest sister Sharon gives a remarkably genuine performance. Richard Fancy as the family patriarch and World War II veteran powerfully illustrates the importance of remembrance even as his son asks us to "forget the Holocaust" with his chilling first person account of liberating Dachau. I would be remiss not to mention Paul Morella as Holly's husband, Howard, Julie-Ann Elliot as Michael's wife, Ellen, and Joshua Otten as Holly's son, Joey. There is not a weak link in this cast." "...Michael is portrayed as the central character, but his journey gets lost in the details of aging parents, money concerns, and a few jarring surprises. The one riveting scene pits Michael—who has written a book challenging American Jews to look beyond the legacy of the Holocaust and away from Israel if they want to stop feeling like victims of society—against his father, who helped liberate Dachau during World War II." 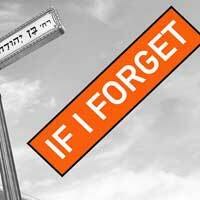 "...If I Forget is a courageous production about Jewish-American dreamers trying to find a way to stay together as a functioning family with their world on a precipice. The family members may argue constantly, but they know when to cease bickering with a joke or a hug. Survival together as a family means that compromise is not a dirty word." "...In recognition of the deeply difficult questions that the play evokes, Levenson's ending appropriately feels more like a coda than a bookend. The satisfyingly poetic finish reminds us that no matter our personal or cultural inheritance, it's time that wins in the end." "...In the end, Levenson declines to provide a definitive answer to the question, “Is the past truly a warm blanket – or a millstone around our necks?” This ultimate detachment and open ended approach makes If I Forget all the more satisfying and realistic. The Fischers’ tale reminds us that in lieu of perfect answers, we’re often stuck making imperfect moral compromises, simply to fight another day. And most of the time, that’s good enough. It has to be."